RBA Cuts Rates then AUD Rallies. The Heck?? In their latest rate decision, the Reserve Bank of Australia (RBA) announced an interest rate cut from 2.75% to 2.50%. If you think about it, this isn’t really a huge surprise since RBA head honcho Glenn Stevens had already been hinting that the weak inflation outlook is giving the central bank enough room to ease. With that, some market watchers started pricing in a 0.25% rate cut while others thought that the RBA would actually go all out and slash rates by 0.50%. After all, recent economic figures suggest that the Australian economy may need more help when it comes to sustaining growth. In fact, RBA head Stevens already mentioned that they are feeling more and more concerned about the global economy. He pointed out that global growth is running below average this year, mostly dragged down by the slowdown in China, which is Australia’s number one trade partner. Things aren’t looking too rosy in the domestic front as well. For one, Australia’s trade balance report for June fell short of expectations as it came in at 600 million AUD versus the consensus at 810 million AUD. On top of that, retail sales stayed flat from May to June as consumers opted to keep their hands in their pockets and keep more of their cash in savings. To make things worse, Stevens also noted that Australia is also struggling to lessen its dependence on mining. The central bank is trying to boost growth in the manufacturing, construction, and retail sectors in order to make up for the downturn in mining investment. As for inflation, it’s pretty much where the RBA just wants it to be. According to the statement, inflation is in line with the central bank’s target and it could stay that way for a while. The statement also reiterated that at its current levels, it gives the RBA some room to ease “should that be required” to support the economy. The RBA still thinks that the Aussie is still trading at high levels despite the whopping 15% decline from April though. Policymakers from the Land Down Under expressed favor towards a weaker currency, saying that it “will depreciate over time” which would in turn be beneficial to the economy. So, why did the AUD rally? The overall take on the RBA statement is that it was not as dovish as many had braced for. For one, the rate cut was only 25 basis points and not 50. Whew! Secondly, some analysts point out that the RBA doesn’t seem to be in a hurry to cut rates anytime soon. The statement read that further easing would only come if the economic conditions warrant it. This probably explains the jump in AUD pairs following the release. 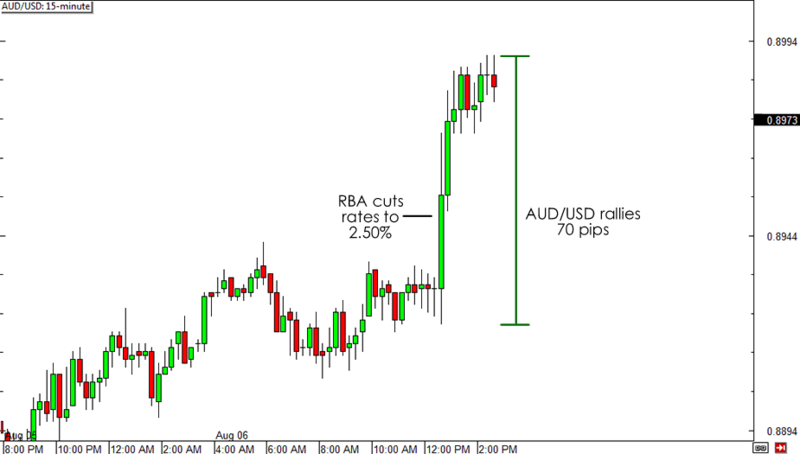 AUD/USD traded higher, rallying by 70 pips, just a few minutes after the RBA made its statement. Be wary on your long AUD trades though. Despite the market’s initial reaction, the RBA still seems to be keen on easing monetary policy even further. It’s just that, we don’t know when. When do you think the RBA will ease again?